W-2 Manager is the easy do-it-yourself online service for managing forms W-2 and W-2C..
Our goal is to facilitate a robust but yet easy to use environment for payroll managers to create, update, maintain, and file forms W-2 and forms W-2C. Data Entry - Manually enter your data one by one using our online data entry interface. Manage - Manage all your forms W-2 and forms W-2C using our intuitive status interface. Advanced Search - Use the advanced search option to pinpoint data information or details in managing your forms. Print & Mail - Create a batch of forms or prepare a single form for printing and mailing. 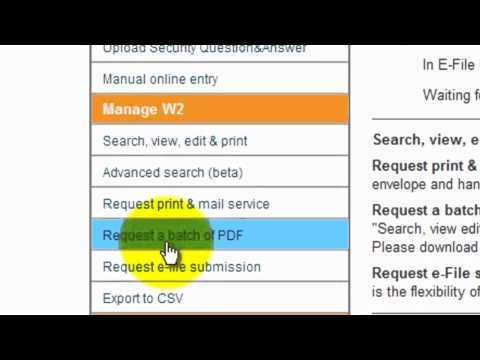 E-File - E-File a single form or a batch in just a few steps. Generate PDFs - Generate PDF versions of all forms for local storage or record-keeping. Forms W-2C - Automatically generate corrections on e-filed forms W-2 at import. W-2 Manager is IRS approved and secured and verified by Starfield Technologies Web Server Certificate. Transactions on the site are protected with up to 256-bit Secure Sockets Layer encryption. W-2 Manager is a service provided to you by C&S Technologies, Inc., a company established in 1996 as an IRS authorized software developer and e-file partner.